Are pews, which we borrowed not so very long ago from the Protestants and the Roman Catholics (who borrowed them from the Protestants) a liturgical accretion without consequences? Or, do pews (and pew-like rows of chairs) make a significant difference in the life of the Church? Or is the idea they do make a difference perhaps only the bothersome complaint of reactionaries who want to obstruct the progress of Orthodoxy in the name of a false traditionalism? Asking ourselves these questions, we came up with the following painful observations. They lead us to the inescapable conclusion that pews and rows of chairs make a significant difference, a big difference, in our Orthodox Christian lives. That has absolutely nothing to do with jurisdictional differences or with shades of opinion in the Church, or with labels like “traditionalist” and “modernist.” It has everything to do with the Orthodox understanding of the Body of Christ, and the nature of liturgical worship. Whether we want to believe it or whether we don’t, pews (or rows of chairs) influence the way we think about the Church. Pews mold the way we think about the Liturgy itself. Pews affect the way we think about ourselves as Orthodox Christian lay people. Pews directly influence our spirituality and our behavior. The use of pews is shaping the future of Orthodoxy in North America. Here are just some of the remarkable things a “mere addition” to Orthodox worship like pews accomplishes. A few of the following comments may come across as sarcastic. They are not. They are simply an open expression of what possibly a majority of lay people, and maybe even a few clergy, think in their “heart of hearts.” These ideas have taken root among us in large part because pews have taught us to think them. 1) Pews teach the lay people to stay in their place, which is to passively watch what’s going on up front, where the clergy perform the Liturgy on their behalf. Pews preach and teach that religion and spirituality is the job of the priest, to whom we pay a salary to be religious for us, since it is just too much trouble and just too difficult for the rest of us to be spiritual in the real world of modern North America. Pews serve the same purpose as seats in theaters and bleachers in the ball park; we perch on them (even during the Litanies which are the specific prayer of the People) to watch the professionals perform: the clergy and the professionally-trained altar servers, while the professionally-trained choir sings for our entertainment. 2) In teaching us to sit back and relax, pews give us the impression that any inconvenience, much less suffering no matter how slight, is foreign to the Christian life. Aren’t you supposed to enjoy church and have fun as a Christian? Church is one of the few times we can take it easy and avoid real life. We don’t come to church to work. (But doesn’t the word liturgy mean precisely, “the work of the people”?) How many American Orthodox today have the “legs of steel” of old world Orthodoxy? Pews teach us to be spiritual wimps. “Could you not watch with me one hour?” asks the Lord. Would we who shrink from standing one hour, be willing to suffer for Christ, as millions of our Orthodox brothers, sisters, fathers and mothers in this very century have had to suffer? 3) Pews destroy the traditional feeling of freedom in church. With the installation of pews, we are no longer “bothered” with all the moving around which used to take place. You know, grandmothers lighting candies, children kissing icons, and the worshippers gathering around their priest like a family gathered about their father. 4) Pews fill up the open space in the middle of our temples, where the clergy and the people used to join together in a sort of sacred dance as the clergy, censing and processing, moved amidst the constantly changing configuration of the Laity. Today this is reduced to the priest and servers marching in and marching out. How can we dance with pews on the ballroom floor? Pews transform worship for us into the merely formal and frosty affair that it has become in mainline American religion. The colder worship gets, the less attention we must pay to the unreal demands that religion, as our forebears knew it, puts on us. Certainly we can’t allow our religion to become our way of life, if we expect to get ahead in the real world. 5) If children must be brought into the Church, at least they can play under the pews, where they won’t be distracted by the ceremonies going on up front. Do kids understand all that anyway? Wouldn’t they be better off in Sunday School coloring pictures and playing games, where they don’t bother the adults while they sit back and enjoy the liturgical music concert? 6) Although pews are admittedly not a feature of the Orthodox liturgical tradition as our ancestors knew it, we’re in America now, and here things are different. We need to be relevant. The more we can be just like the big and important religions in America, the more influence Orthodox Christianity will have. We can’t afford to lose our big chance to mold American thought, and we will lose it if we cling to silly traditions with a little t, like pewless temples. And besides, is it not crystal clear that if we look too different we won’t be able to achieve prestige, success and power in our society? Isn’t that what life is all about? 7) Thanks to pews, on the weekdays of Lent we no longer have to endure those humiliating prostrations. Other [Christian groups] don’t do that kind of thing in church, not even the Catholics. Why should we? And during funerals, pews spare us from gathering around the casket like we used to. Isn’t the function of the modern funeral to shield us from the unpleasantness of death? The accepted modern American view is that we never really die—we just fade away. These blunt observations are not meant to offend, but to hammer the point home vividly. The Liturgical Movement and the Orthodox liturgical tradition are both absolutely right: what we do in liturgical worship molds our thinking, attitudes and behavior. That’s precisely why the issue of pews is so critically important. We hope this call for renewal will not be dismissed out of hand as “off the wall extremism,” for this is not a “party” issue; it is a matter of life and death for American Orthodoxy. Pews are a spiritual carcinogen. Like Social Security in politics, pews may be an “untouchable” issue, but in spite of that, Orthodox America must begin renewal in this regard. The pews in our churches are a much bigger problem than the use of foreign languages, for pews silently speak louder than words. Pews outshout the greatest of preachers and the most effective of teachers. Pews skillfully contradict the most excellent administrator and the most caring pastor. Pews drown out the words of our greatest scholars. A parish priest can brilliantly teach his flock about the place of the Laity as members in the priestly Body of Christ and co-celebrants in the Divine Liturgy, while the pews his people are sitting in, with the subtle dynamics of liturgical drama, insidiously whisper the very opposite. 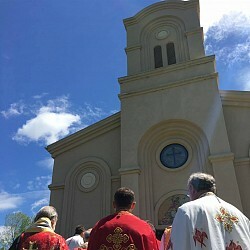 “Psst … all you really need to do is pay your dues, call yourself Orthodox, watch the Liturgy, and leave the full-time practice of religion to the paid professionals.” Neither unknown languages, nor choirs, nor even operatic compositions, could ever deprive the Laity of their active participation in the Divine Liturgy as members of the priestly Body of Christ. For they also serve who only attentively stand to pray. But when the Laity, as a mistaken gesture of kindness, were given pews so they could sit back, relax and watch the show, it was as if they had been deposed from their Sacred Ministry.